so, it’s been a while and i’ve been neglecting the blog. 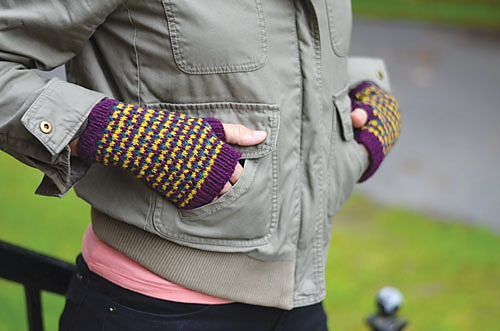 there are a lot of reasons for that, but mostly i haven’t done much knitting over the past few months; in the months from february to june, i finished a crop of designs that were to be released in the fall, and then never started anything new. i’ve been doing a lot of live music photography and reading, and started taking pottery lessons. but i have been feeling the itch to get back into knitting. here are a few of my deadline projects from the first half of this year. gammon, from o-wool. 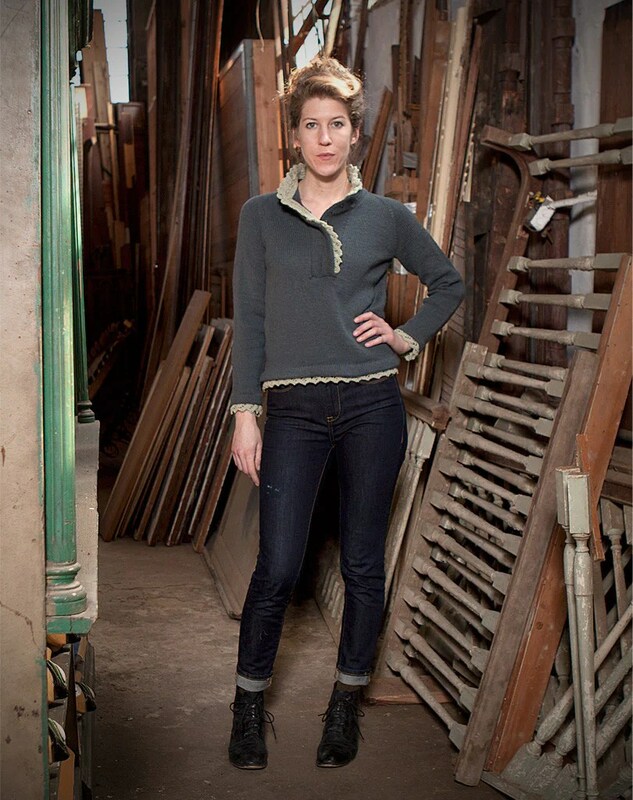 this henley with deep hemmed edging and lacy accents was fun to knit and is the perfect fall weight. it has snap closures and you can wear it open, like in the photo, or closed, so that the high neck keeps you nice and toasty if you forget your scarf (like i always do!). i love working with o-wool yarns, so this one was a real treat. tern and the mitts pictured below, peregrine, were put out by harrisville designs. i LOVE this sweater. another fun thing about the harrisville patterns is that i did some photo work for their fall line, so some of the pictures you see on their website are mine! both of these pictured are mine, although a different picture is used officially for the tern pattern. it was a great opportunity to hone my photoshoot skills. well, that’s what i’ve been up to! i hope to get back to the blog in less than ten months next time. i’ve been a bad blogger. truth is, i just haven’t been doing a lot of interesting knitting OR spinning recently! i got kind of caught up in a last-minute, totally ambitious holiday project and kind of lost my motivation for a little while. that plus a large secret project put blogging on the back burner for a while. the big holiday project was spinning a skein of sock yarn for my boyfriend’s mother’s christmas present. with better planning, i could have gotten this done easily, but i had the idea five days before christmas. i don’t remember the yardage; i think it ended up being about 325 yards of sport-ish weight, though, which for about 4 oz of superwash bfl is pretty good for me. 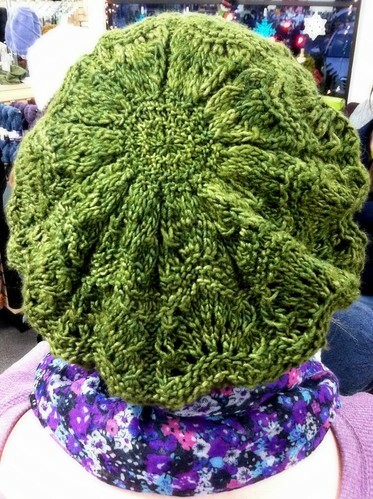 i also finished my good buddy melissa labarre’s greenery beret from her & cecily macdonald’s book weekend hats for a webs store project! as i already blogged, i had a hat pattern in this book, too, but i felt like i should branch out a little for the store project and picked a different hat. after all, i’ve already knit mine three times! my coworker greta was nice enough to model for this picture. i’ve also picked up another craft, possibly permanently, possibly temporarily. 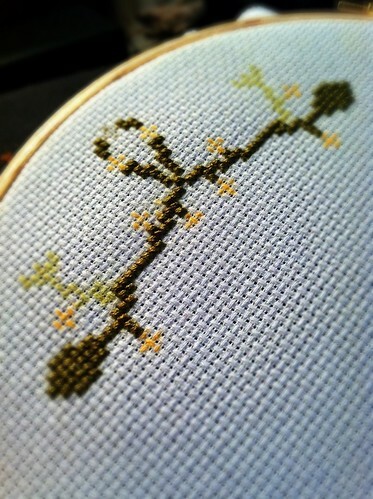 either way, i am so excited about this project, but for now you just get a teaser photo! just wanted to do a quick post to let everyone know that the pattern for my off-season cardigan is now available on ravelry! 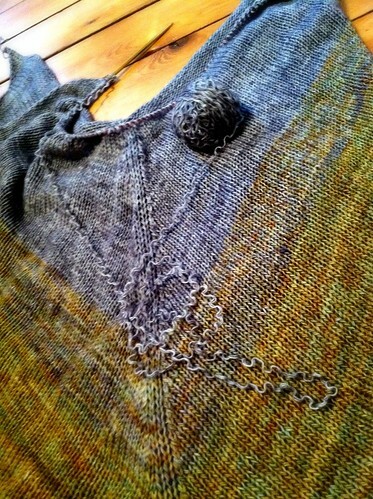 named for my favorite time of year to go to cape cod, this is a cozy cardigan with some interesting colorwork details. 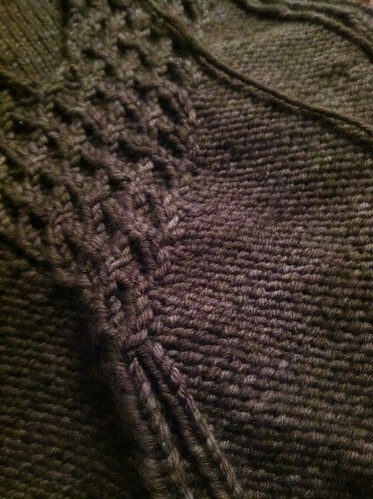 so, you may remember a few months ago, i had a great tunic going that was going to knit up “so quickly”! and you haven’t seen it since then. the reason is, i got to the end and decided i was unhappy with it, so i ripped a bunch of it out! now it’s languishing in my on-hold bag waiting for me to get to it. since i think i will love it so much when it’s done, i figured i’d post about it online to try to motivate myself to complete it. does anyone else need help with a hibernating project? we can motivate each other! it is pretty darn comfortable! 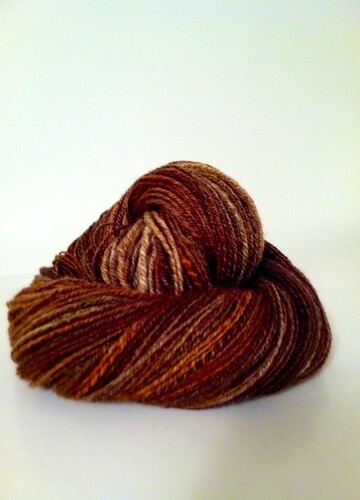 that malabrigo twist is really one of my favorite yarns! this is turning into something of a thanksgiving tradition for me. 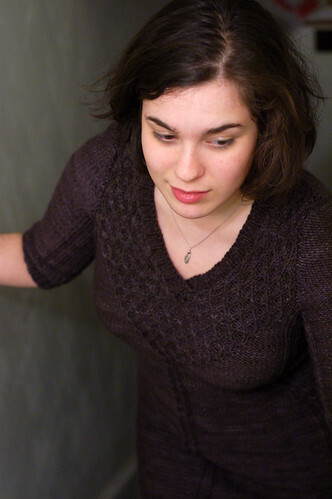 last year, over my thanksgiving break (thursday-sunday) i knit my charlemont pullover. 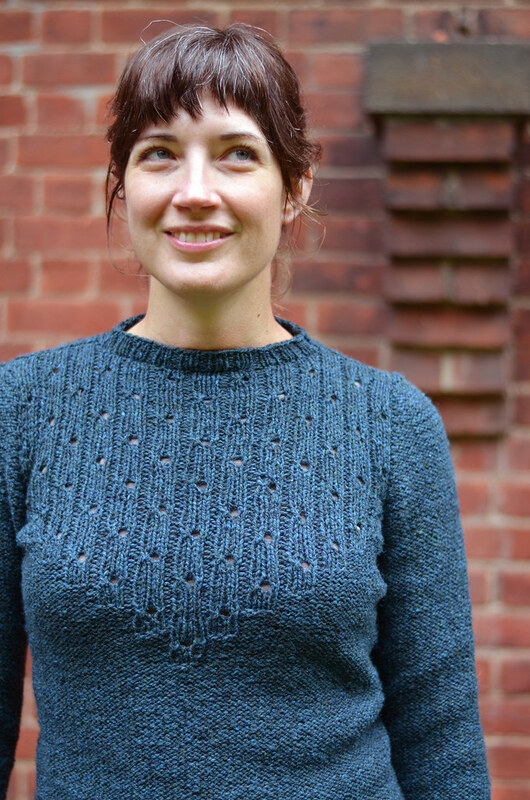 i hadn’t heard back about the cardigan pattern yet, and had assumed it wasn’t accepted to knitscene, so i started knitting it for myself as a pullover with the end goal of self-publishing. of course, just after thanksgiving, i got an email asking about it for the fall 2011 issue! so i never posted about it. but the majority of the knitting did occur during those few days! 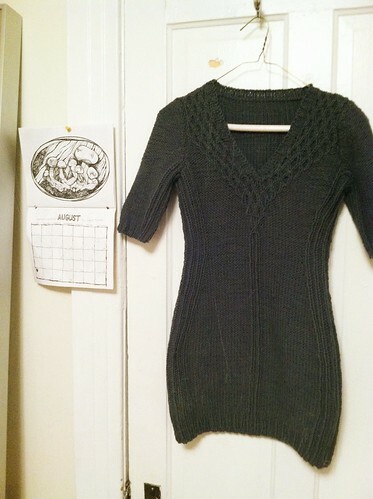 this year, i decided it would be a good idea both to knit up a sample garment of a recently published pattern, and to indulge my desire for a mini-sweater-dress (sweater-mini-dress?). 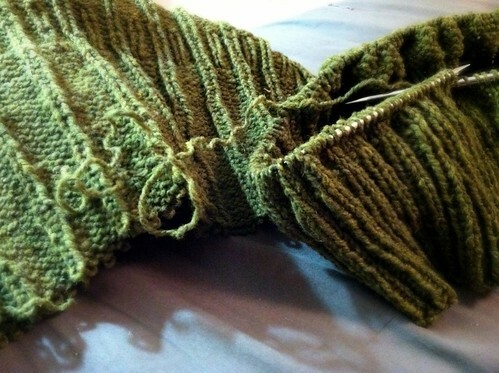 i’ve finished a sleeve, but of course didn’t read the directions and will have to rip out the cap!. i’m also done with most of the body. i made a few alterations – mostly in length and shaping, but i also wanted to experiment with starting the pattern lower than i decided to in the pattern. i’ll post more about this later when i know how i feel about the changes. over thanksgiving, i also got a chance to take a photo of an old FO. a few months ago, due to some crossed wires, i accidentally knit up a pi shawl, in madelinetosh prairie, as an unwanted gift. of course, what the recipient (who had no part in the wires crossing) actually wanted was a much easier circle scarf, which took about two hours to throw together when it came down to it, so it wasn’t a huge deal. 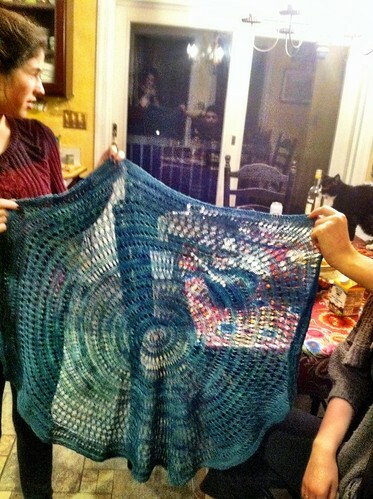 and then, my younger sister lay claim to the pi shawl, so no knits were orphaned by this story. unfortunately, i only had my phone to use as a camera, but this will give you an idea of the size! it is just large enough to act as a scarf and keep her warm in her chilly office. i am so excited to make this post! i have to get that out of the way first. last summer, as i was moving out of my old apartment, i found a box of yarn waiting for me on the doorstop there. 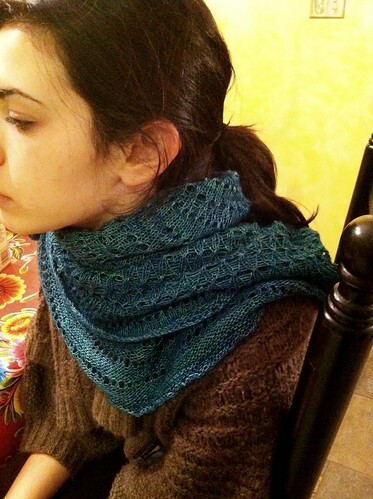 it turns out, it was for a design i had submitted to interweave knits! i couldn’t believe that my garment had been selected for the issue. of course, i loved what i had submitted, but i’ve learned that even the best designs sometimes don’t end up in publications. there are many reasons why this happens, and all of them are equally valid, so, as a designer, i try not to take rejections personally. i couldn’t believe it! i feel so honored to be on the cover of this issue. the other garments and accessories in it are gorgeous. their other photos of the sweater are beautiful, too. 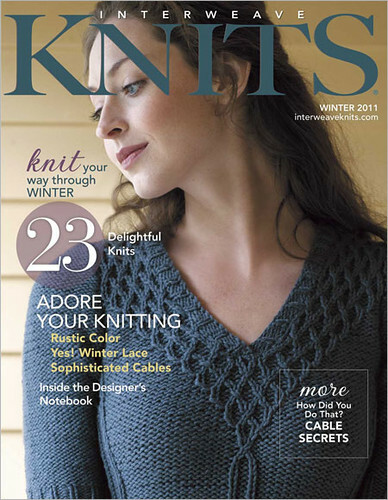 for more information, check out the interweave knits preview of this issue.